Certainly no one expected a sweep, right? Stealing a game in Rockford was a pretty good outcome. In an ideal world, yes, everyone would be at home roasting hot dogs and grilling burgers today. However, the trip to the H-E-B Center today will either end in handshakes or set up a decisive game seven tomorrow. Either way, goaltending is the storyline of the series. Collin Delia allowed 13 goals in Games 1, 2 and 3, giving way to Jeff Glass. The 32-year old netminder had somehow never started an AHL playoff game in his career before last Thursday. In two starts, he's stopped, 68 of 71 shots against, a .958 SV% and 1.47 GAA. The performance has vaulted him ahead of Delia and Texas's Mike McKenna on the leaderboard for the postseason. However, no one in the playoffs has played more games or minutes in the current campaign than McKenna. His 895+ minutes of hockey over 14 games. 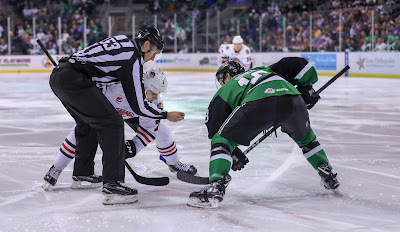 After a shakier than usual Game 4 and 5 in Rockford, it feels like McKenna turns in a big one tonight at home to push the series to close in six. Texas had success in previous contests in Cedar Park especially when they got under the skin of the IceHogs. Scoring first and then frustrating the Rockford offense is a great way to pick up power plays and make it hurt even more.